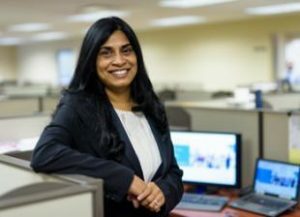 After 15 years employed at one company, Anu Boddu wanted to broaden her career horizon. So the senior business systems analyst began to peruse online job sites. On Northwell Health’s careers website, she found an ad for a virtual job fair for information technology (IT) positions. The event was also advertised through social media ad campaigns, job boards and niche job sites. Such job fairs have surged in popularity over the last few years, especially in technical fields and other niche sectors. Northwell’s virtual job fair attracted more than 1,100 job seekers from January 28 to April 28. Applicants could search for IT positions in nine departments, including security and disaster recovery and healthcare analytics; chat live with department representatives and talent acquisition specialists; and get real-time answers to questions. The ease and privacy of the virtual job fair especially appealing, Ms. Boddu said. She was among about 60 job candidates who were invited to in-depth, in-person interviews. Ms. Boddu began working with Northwell Health in April. As a senior project manager in IT security, she oversees projects that protect the health system’s wireless network and patient information. She’s in good company, with an IT networking team of 1,500-plus employees working at the health system’s hospitals and facilities.